Greg's first instructional DVD presents two-handed tapping lessons from a completely new perspective. 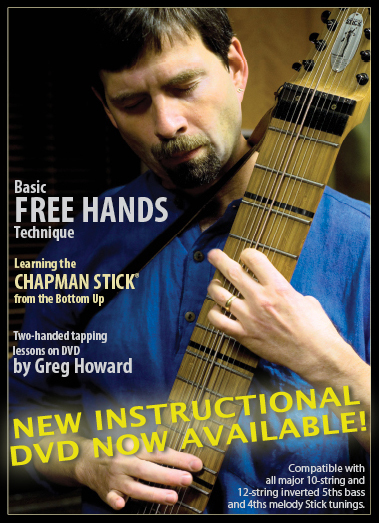 Basic FREE HANDS Technique, Leaning the Chapman Stick from the Bottom Up, is the first Stick instructional DVD dedicated exclusively to your technique development. This two-hour DVD focuses on Greg's emphasis on hand movement to support the fingers developed as a player and teacher of Emmett's method. The material on the DVD works with all major 10 and 12 string Stick tunings, and there is no notation or tablature to read. Skype and Google Chat Lessons.